Covers white hair; Provides maximum color intensity. DESCRIPTION: Vibrance Developer Lotion 1,9% from Schwarzkopf is a developer of cream peroxide, designed especially for IGORA Vibrance. It has the perfect consistency and strength of the peroxide to offer the best color results when using Schwarzkopf's tone-on-tone color system. Leaves hair in great condition and easier to comb. Ideal for darker hair coloring. 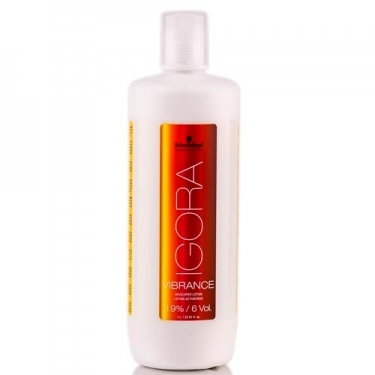 Mix the Igora Vibrance cream with Igora Vibrance Developer Lotion in the ratio of 1: 2 (30 ml cream: 60 ml developer); The development time depends on the intensity of the desired tone - 10-20 minutes; After rinsing the mixture, wash the hair; Carefully follow the instructions given in the package insert.